Was standing on the platform of the Tanah Merah MRT Interchange. 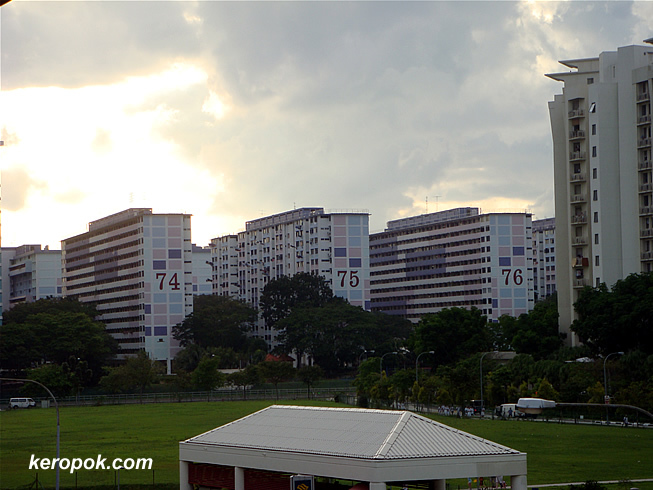 Saw 3 big numbers on the wall of the housing blocks. Those numbers are so huge! Do you realise that they are two floors high? Look carefully. I wonder how it feels to live in that "village?" yes, the numbers are certainly large and highly visible. two floors high? What do you mean? Hehehe, good for people with poor eyesight like me. :) Please understand that older people need things bigger. Even the handphone that I bought must have bigger prints. Am born in postwar period, did you know that when I reach 65 there were be 1 in 4 people in Singapore that are my age. this is cool. i think big numbers are good. if possible, i'd suggest, numbers to be shown at the angle from the carpark as well - cos sometimes its hard to see from the carpark but only seen on the mainroads.